I was chatting to my friend as he flicked through email on his phone. Suddenly he stopped talking and I could see the look of exasperation spread across his face. The young marketing assistant in his company had posted something smart on social media. Well,she thought it was smart. So much so she dropped him an email to let him know how well she had done. The post was a derogatory remark about a competitor accusing them of underhand behaviour. So whilst the marketing millennial was patting herself on the back, my friend jumped on a ‘damage limitation’ call with his legal team. Millennials get a bad press. As they are not some cloned species despite what we are led to believe, I hate to generalise. However, the common thread is this. They are different than we were when we were starting our career. Millennials may be different but so is the workplace. We hear frequently about the ‘best places to work’ and how they embrace a culture of autonomy. They expect their employees to take ownership for their work, giving them space and freedom to work towards a common vision. These companies are applauded – and rightly so. Increased productivity and rock solid employee engagement has been proven as the end result. More and more companies are moving in this direction. But this new world – where we give employees more freedom to determine their own actions – isn’t it a hard environment for an inexperienced and overly confident graduate to come into? 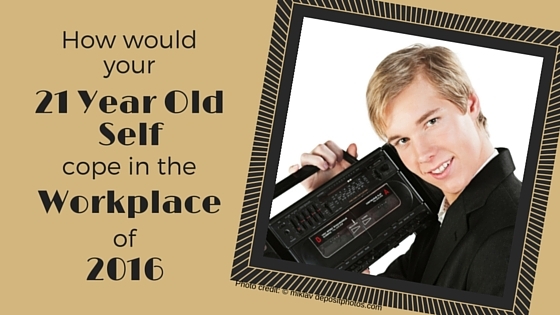 How would your 21 year old self have coped with starting your career in 2016? At the risk of sounding like my grandmother, it was different in our day. Organisations had more boundaries. Our growth may have been slower, but it was safer. We were just as green but our over ambitiousness and bravado was never allowed to go too far. Micro management wasn’t a thing – it was just called management. Our motivation was money and career progression. We waited patiently for our annual review to get feedback. There were rules, and to question them was a big deal. We didn’t have the ability to do much damage. It would have been hard to get into a situation where you could publicly embarrass your company. Forget about a lack of social media, I didn’t even have access to a computer in my first career job. All my letters had to be typed by my manager’s intimidating secretary. My biggest fear was putting the wrong number into the fax machine and potentially sending a sales proposal to a completely unrelated company. And if I wanted to bad mouth my company, I didn’t have Medium to write a public letter to my CEO. I couldn’t rate the company for future employees to see on Glassdoor. How would I have got that message across? Paid for an advert in The Times? Over confidence is not unique to the millennial generation. I cut my teeth on a graduate trainee scheme. I was in a group of 13 smart and talented peers. We thought we could change the world. We were confident that our combined experience of brain numbing holiday jobs, two gap years and a few Saturday jobs made us invincible. I remember a discussion about how we could fix a failing division. We felt we were smarter than experienced leaders who had failed up to that point. It makes me smile now. Our confidence was impressive but probably hugely misguided. There were also no avenues open to us to be proven right or wrong. So we will never know for sure. Of course we did not have the role models that the millennials have today. The people in their twenties that are literally changing the world. I don’t think I could’ve named a business leader when I was starting out. But nowadays Mark Zuckerberg and his peers are not only accessible whilst they shake up the world we live in, they do it without even wearing a tie! So why wouldn’t some young recruits demand more. It makes sense that they are always hungry for the next challenge. Why shouldn’t they believe that anything is possible? You no longer have to be older to be hugely successful. And we shouldn’t stamp out that enthusiasm and drive. Great innovation can come from less jaded minds. We learnt our trade with some restraints. As those restraints lifted in the new world of autonomy and ownership, we entered it cautiously with a few years of experience behind us. Most of us had lost that bravado before we could do any real damage. But for your new graduates you are hiring now, they have more freedom with minimal experience. We may assume they have the ‘common sense’ we have but why would they? That comes with experience. And it is hard to pick out everything they might not know and teach them that. But somehow it feels like you should because the scope of possible disaster is so much bigger than dialling the wrong fax number. Social media is second nature to millennials. But still the potential to do damage in 140 characters is pretty high when they have yet to learn the rules of the game in the business world. I am not saying we should encourage micro management. Far from it. The way work culture is transforming will undoubtedly bring out the best in many of your new hires. You remember when you thought you knew a lot more than you actually did? You knew you lacked experience but you never knew how much. How could you? You don’t know what you don’t know. Well, that is the same for millennials entering the workplace today. The difference is that the world is faster now with less safety barriers. Some crashes are inevitable. So think ahead about what those crashes may be. Provide some guidance in advance to your young new hire about the choices they could make. And help them learn quickly from the choices that had consequences they didn’t anticipate. And just take a moment to think about how your inexperienced 21 year old self would have coped in this new world of work.